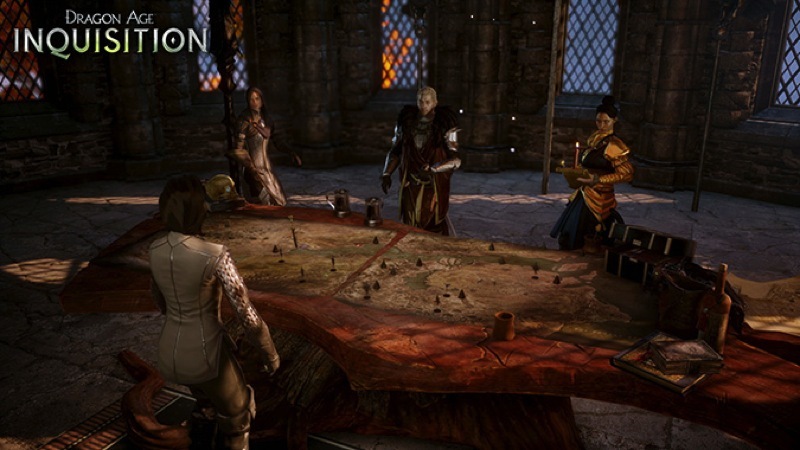 There are a bunch of reasons that I’m excited for Dragon Age: Inquisition. The story-telling from Bioware has always been fantastic, but I’m also keen for all the extra RPG and tactical elements of the game. The war table is one such element, and it is sort of making me giddy to think about. Leliana is the leader of your agents who uncover secrets, assassinate enemies, and sabotage your enemy’s organization. Cullen leads your military, so he’s focused on building your army and training and equipping your forces so you can use them as a hammer against the Elder One. Josephine uses political power and diplomacy to advance your Inquisition’s cause. Each of the advisors will want to approach challenges in different ways, but it’s your choice about which action to take. Players earn influence and power as they explore, overcome enemies, complete quests and close rifts. That influence and power is then spent at the war table when you send agents on an operation or being a new major story plot. Operations have various rewards ranging from gold and rare crafting materials to equipment, recruits and even rebuilding structures you’ve seen on your adventures. How do these operations work? There are over 300 missions and operations available on the war table, and they can change depending on your previous choices and actions in the game. There’s a range of types: scouting missions to establish the first camp in a new area you’d like to explore, building missions to raise structures in the areas you’ve being exploring, recruitment missions to bring expertise into the inquisition, treaties, resource-gathering, political assassinations, and many, many more.